Frustration rises in me. Gritty between my teeth, it mixes with the bitter taste of fear. Heartbeats of panic roar in my ears. My muscles tighten. A primal urge for flight screams inside my head. How can I stand here one moment longer? I’ll go crazy, be swallowed up, suffocated by the weight sitting on my chest. I must escape before it’s too late!!!! All my life I have run at moments such as these. At work dealing with a deadline. Having an argument with someone I love. Any time a person or situation didn’t meet my expectations, when things got difficult or boring or overwhelming. Like a child, when life was no longer fun, I just wanted someone to make it all go away. In these situations, I have simply turned away, left the school or job or city or relationship when things started getting complicated. I don’t need this, I would say. I refuse to deal with this. It’s not my problem. I’m outta here. I’m going somewhere where it’s interesting, where I won’t be judged, where things won’t be so unfair. But the running is in vain; my fears, insecurities, and frustrations follow me — monsters, ruling and limiting my life. The one place I can’t run is in the dojo, where the lights glare down on me as the boards refuse to break, the tambo slips from my hand, my sparring partner kicks me in the gut. The same qualities that hold me back in life limit my training, keep coming back to haunt me and until I deal with them, I can’t move forward in my training. Fears of failure, inadequacy, ignorance, commitment, slapping me in the face at every turn. There is nowhere to run, no place to hide in the dojo. But that is its irresistible draw. 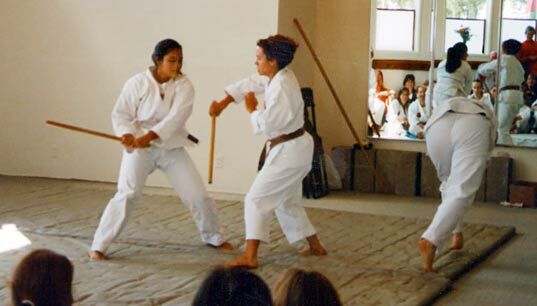 Martial arts may be good exercise, but what I get from it is a growth of character, a sense of self-control, an expansion of my spirit, a joyfulness in my soul for facing down challenges I would never take on if it were not for martial arts.In the dojo, all my weaknesses are exposed. Training forces me to confront them in ways my normal day-to-day life would never do. I can’t deny or avoid them. They are there for me and everyone to see. I have to spar even though I’m not naturally good at it. I have to do pushups even if I’m tired. I have to perform kata applications even if I’m bored. But, as in life, people are there, offering me support in my struggles if I’m willing to accept it. The compassion of my senseis and empathy of my classmates make the dojo a safe place to stay and fight. I find it impossible to run when they are there. I can’t beat my fears consciously, but by going to class day after day, week after week, year after year, knowing that maybe I’m progressing in one area this week only to slip backwards the next; but at least I’m still going, still trying, not letting all of my life’s baggage weigh me down, not surrendering to the flaws of the human character, the roadblocks of human existence. Martial arts may be good exercise, but what I get from it is a growth of character, a sense of self-control, an expansion of my spirit, a joyfulness in my soul for facing down challenges I would never take on if it were not for martial arts. I used to feel like the philosophy requirements of Cuong Nhu were an academic exercise. But so many times in the past few years, I have heard O’Sensei’s voice in my head. These are the things you need to know, Raimi: Patience. Perspective. Perseverance. Determination. Selflessness. Calm. Commitment. Self-control. These words echo with every board I cannot break, every sparring glove I take in my face, every quarrel I have with my lover, every time life rises up and spits injustice in my face. When I look at my belt I see tangible evidence that I have not run away in the face of overwhelming challenges. I have stood my ground and am better off for having done so. I learn this lesson more in the dojo than any other place in my life. Training reminds me that although my progress may be infinitesimal, simply trying is a victory in itself.